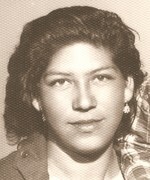 Margarita Burciaga, 78, of Las Cruces, New Mexico was received in the arms of our Heavenly Father on April 4, 2019, surrounded by her family. She was born April 20, 1940 to Jose and Paulina Limas. She is survived by her husband of 62 years, Candelario Burciaga. They were married on July 12, 1956 and have seven surviving children of nine: Manuel & Terry Burciaga of Las Vegas, NV; Martin & Laura Burciaga of Las Cruces, NM; Margarita & Filiberto Montes of Gypsum, CO; Jenny & Abel Marquez of Las Cruces, NM; Paulina Burciaga of Las Cruces, NM; Rita Baltazar & Daniel Armendariz of Las Cruces, NM; Maria & Aurelio Batres of Las Cruces, NM. She is survived by 20 grandchildren; Julio (Alex) Burciaga, Diana (Jose) Cardenas-Burciaga, Candelario (Jessica) Burciaga & Jose Burciaga; Laura (Aaron) McDaniel-Burciaga, Cindy Burciaga, Martin Burciaga; Luz Odalys Montes; Abel Jr. (Sarah) Marquez, Janine Marquez & Juan Marquez; Litzy, Myrka & Makayla Carrillo; Ernesto, Abigail, Jacqui Baltazar & Ariana Armendariz; Mark & Willie Batres. She has seven great-grandchildren. Also left behind are her siblings, one sister, Esperanza Delgado; three brothers, Jose De La Luz, Carlos and Encarnacion Limas. “Doῆa Mague,” “ama,” “grandma,” “gma,” “mom,” “la jefa,” are some of the names her kids and grandkids called her but to all of us she was the glue that held us together. She was a woman who didn’t need much luxuries, her treasure was her family. She cared and worried about everyone. She always made sure you were well fed when you went to her house. She had a special bond with each of her kids. She made friends easily. She didn’t have too many friends but the ones she did have were very special to her. She was very happy when her kids and friends came to visit her. She was a great woman, who taught all of us love, compassion, honesty, hard work, and most importantly she taught us to be strong. She is going to be loved and greatly missed by all of her loved ones. She left to make her home up in heaven ready for when we are back together again. She has now joined her son, Jose Luis, 9 months; an infant daughter, Manuelita; her grandbaby, Jesus Burciaga; her parents, Jose and Paulina Limas; parents-in-law, Bernabe and Juana Burciaga; one brother, Celso Limas; a son-in-law, Ernesto Baltazar. We invite you to join us to celebrate her life at Getz Funeral Home. Visitation is Friday, April 12, 2019 from 6pm-7pm. Rosary will begin at 7pm. Holy Mass will be Saturday, April 13, 2019 at 11 am at Our Lady of Health, with final interment at Masonic Cemetery. To send flowers to the family of Margarita Burciaga, please visit our Heartfelt Sympathies Store.